Dupion is best known as the popular silk wedding dress fabric, with its characteristic slub lines, texture, and stiffish (not drapey) handle. 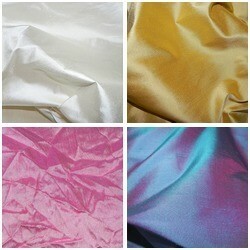 Also available in lower cost polyester versions, usually satin-backed, reversible, and more drapey. A classic choice of bridal fabric especially for bridesmaids, but also prom dresses, and other special occasion silk dresses due to its huge range of colours and shades. The washable polyester versions of this dress fabric are also suitable for day and evening wear. Two-tone or 'shot' colours have warp threads in one colour, and weft threads in another so that the colour subtly changes as the fabric moves. Also spelt: doupion, dupioni, or douppioni, and sometimes known as raw silk.